Protect your logs from water infiltration by sealing log checks and cracks that can develop along log surfaces. Check Mate 2 is specially formulated to complement the colors of our Lifeline finishes. Surfaces of checks must be clean, dry and free from any oils or wax. Use Backer Rod wherever possible. I have been using this product all summer for log maintenance on our home. It has been easy to apply, clean up and use. You can now barely see where the checks were in our logs and the air sealing has now helped with heating. 2 Years old and time to start filling in some of the checks. Perma Chink's instructive videos on use of backer rods and Check Mate are easy to understand and its an easy product to work with. We are 1st time log home owners and really happy with our entire PremaChink protected home. Great product! I purchased this along with Log Wash earlier in the yesr. After using (AND LOVING) the results from the Log Wash, we sealed in quite a few checks and cracks in the exterior of our home. The kit was very convenient and easy to use. Colors matched perfectly according to online charts which is always a pleasant surprise! After seeing and benefiting from the product for a few months now, I can confidently rate this product with 5 stars and will be purchasing a few more tubes to deal in some larger gaps. 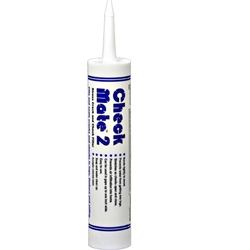 We placed an order for your Check Mate 2 Walnut Brown caulking kit recently. This caulk worked very well for all of the checks we needed to seal (used the backer, too) and the color matched our dark brown logs almost perfectly. It seems a little pricey to me, but the product itself is great! Great product! I used the Check Mate 2 Clear and backer rod to seal several half inch checks in my logs and also gaps around my windows. It is easy to use and the Clear color disappears into the surrounding wood and is not obvious. The Check Mate 2 Kit is what I purchased. Very pleased with it! I found this product while looking on your website and realized I needed to fill in some of the larger cracks in my logs. This product was easy to use along with the backer rod that we also purchased. Dark Brown is the color we used. We love your products! Very good product! We used it to seal up several small checks in our logs and boards. I would recommend the clear colored Check Mate because it will go with any stain color. We watched the video on the website about Check Mate 2 application, so I would recommend seeing that if you have a chance. I think this is a great caulking product! We ordered the Check Mate 2 kit in Medium Brown and used it to fill in a few large checks on my log home. It also works well to seal gaps and cracks in other places around our home. The only thing I would note is that you may want to purchase Clear or make sure the color is close to the stain color because it does not really take much stain over it. Love this product otherwise! We used Check Mate 2 to seal our checks about a year ago and it's performing perfectly. Our checks are all still sealed tight. It looks like it's going to pass the test of time! The video on the website really helped with application.